On this class we will implement the minimum ObjectARX application without use the ARXWizard. To do that we will need to create the Visual C++ project from scratch and perform some tuning on project settings. 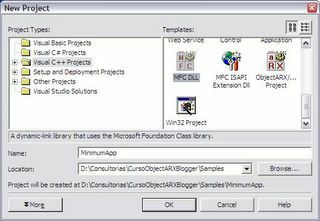 On this dialog, choose Visual C++ Projects tree node and, on the right portion select MFC DLL template. After that, specify the name and location you would like to use for this project. Click OK to continue. After click OK the following dialog will be displayed. This dialog has two steps (in this case). The first step, called Overview, just confirm what you have entered before. 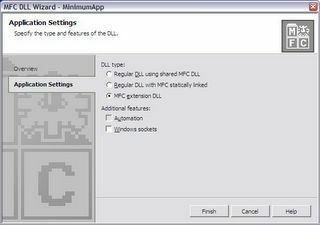 Now we will choose the MFC extension DLL that is the most adequate DLL type to build ObjectARX applications. Note that the use of MFC is not an obligation. You can build ObjectARX applications without MFC but I strongly recommend you to always use MFC because if you don't need MFC now you probably will need it in a near future. I would like to avoid more technical discussions on this subject because this is not our focus on this course. MFC is a huge and rich library that will avoid several lines of code and will make your application safe and easy to manage. Click Finish to continue. 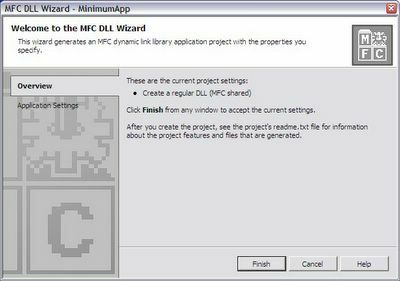 After clicking Finish Visual C++ will create the MFC DLL project files for you with basic implementation of some features. Remember, this is just a minimum application and we will only make a few things to turn it ready to compile, build and load into AutoCAD. The Visual C++ environment is very intuitive and I guess you will not face much trouble to learn how to use it. Basically it has a project management area (default placed at left side), an editor area (placed at the right portion) and the command / monitor area which is placed below. The project management area uses a tab dialog bar to provide tools like Solution Explorer, Resource View and Class View among many others. Select the Solution Explorer tab and you will see your project files, organized using a tree. This explorer can handle multiple projects but only one can be the default which has its name in bold font. Now we will need to change some basic settings on our Visual Studio environment to allow us to compile and link ObjectARX application. 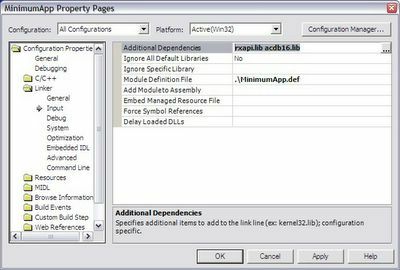 As I said on previous classes, to build the application, which is a DLL, we will need to compile using the provided ObjectARX headers (.H files) and to link with ObjectARX libraries (.LIB files). The easiest way to do this is to change the global Options of Visual Studio. This will affect all projects and you won't need to do this again for new projects. Open the Tools menu and select Options (the last entry). The following dialog will appear. Select Projects and then VC++ Directories. On the Show directories for field, select Include files. 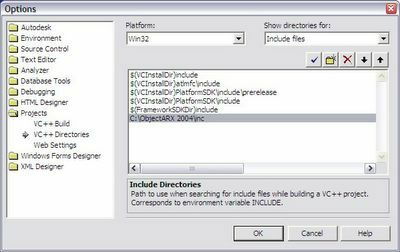 Below will appear a list of the include directories that Visual Studio already has and we will add our ObjectARX inc path which contains the desired .H files. Click on the folder icon and click on the ellipsis button and search for the inc path (in my case, it is placed at C:\ObjectARX 2004\inc). Don't click OK. Now we need to add the library files directory. Select Library files on the Show directories for field. Repeat the above procedure to add a path but this time you will add the lib path (in my case, C:\ObjectARX 2004\lib). Click OK to finish. Now we need to configure our project. This will require some project settings change and some code typing. First, we will change the project settings. Right click the project name inside Solution Explorer and select Properties. The following dialog will appear. Select, on the Configuration field, All Configurations. This will allow us to change both Debug* and Release* settings at the same time. On the Configuration Properties node, select C/C++ and Code Generation. The right portion of this dialog will display a list with several properties. 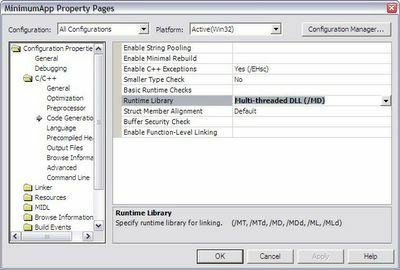 Select the Runtime Library entry and chance its value to Multi-threaded DLL. This is a requirement to make our DLL compatible with AutoCAD environment. Now, select the Linker node and General. On the Output File entry change the extension name from DLL to ARX. Note that Visual Studio use several macros (those names with a $ at beginning) to allow easy and flexible path configuration. Still inside Linker node, select Input. Here we will add those libraries our application will use. This will depend on what features you are using inside your ObjectARX application. In this case, we will add just the basic two libraries called rxapi.lib and acdb16.lib. Select the Additional Dependencies entry and click on ellipsis button. Type the two previously mentioned files. These libraries are located at lib folder. Remember that on previous classes I have talked about the features each library has built in. Pay attention to the name between quotes in front of LIBRARY section inside this file. This name must be the same name you have entered on the output file. In other words, if your project generates a ABCD.arx file you need to have LIBRARY "ABCD" inside the DEF file. The next step is to change our StdAfx.h file which is the key compilation file. We will need to inform Visual Studio to use Release version of MFC libraries when our project is being compiled using the DEBUG directive. Now we are ready to build our application. Open Build menu and select Build Solution (or F7 key). Visual Studio will compile and link and build your project. If you have followed all above steps carefully it will generate the application without any error. Start AutoCAD and run APPLOAD command which will show the following dialog. 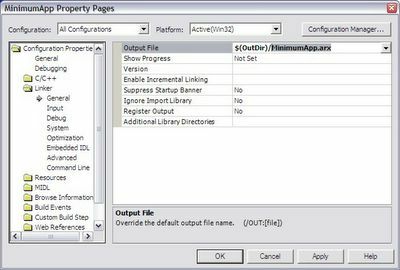 Browse to your project and you will find the application inside the Debug folder which is the default compilation type. Select it and click Load button. A message will appear at the bottom of this dialog telling you that your ARX was successfully loaded or not! That's it, your first ObjectARX application is loaded and is running inside AutoCAD! Next class we will do the same using the ARXWizard. Stay tuned! Why not use ARX.NET instead? 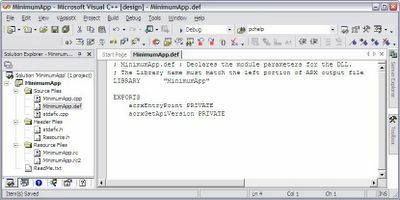 It's a lot easier to setup - the "Minimum application" is almost trivial. Class 3a cover the minimum application from scracth without using the ARXWizard. Class 3b, that is almost ready to go, will cover the same minimum application but using ARXWizard. My intention is to show what ARXWizard does and not leave users blind. Wizards are great but you should always know what they do for you because if they fail (and trust me they will) you will need to fix the code by yourself. Hope you are enjoying this course. Not Visual Studio .NET, but the .NET APIs in AutoCAD. With the .NET APIs, your "Minimal application" becomes almost trivial and you don't have to deal with a bunch of ObjectARX infastructure. I think everyone should first try any new ARX development using the .NET APIs. 2.I will cover custom entities and objects topic on this course. This feature is only possible through ObjectARX. I follow your instructions exactly, but I get a ton of error when I try to build. Is it different if I've got ObjectARX 2005 and VS 7.1.30088? hmm...as i know, objectARX applications can not be compiled under VC7.1 due to incompatible between VS2002 and 2003.
my biggest issue is i have already updated to vs.net 2003 so i cant even use this can i??? You will need to request a downgrade from Microsoft. As far as I know they will charge you only for the media. tried this and build failed. using Visual Studio 2002 - SP1 with the Object ARX 2006 package from Autodesk. failure appears to have nothing to do with ARX. Probably something to do with default settings becuase the build fails on a include file called new.h. Here is the build log. Build log was saved at "file://c:\Documents and Settings\Bill\My Documents\Visual Studio Projects\arx_minimum_app_01\Debug\BuildLog.htm"
ObjectARX 2004,2005 and 2006 does not support VS2002 SP1. If you just get the sample project and compile it should work fine with VS2002 SP0 (initial release). If you have installed the VS2002 SP1 by yourself, give a try and uninstall it. If this not solve your problem you really need to check your ObjectARX SDK files and, as a last effort, reinstall VS2002 SP0. This sends a message to the Output window while compiling. I have a similar problem as anonymous user before me. "ObjectARX 2004,2005 and 2006 does not support VS2002 SP1." What about OARX 2007 and VS2005? Regarding to VS2002 SP1 it is not officially supported by Autodesk so you need to use VS2002 SP0. On AutoCAD 2007, you need to use VS2005. Today I have no information about VS2005 Service Packs and respective compatibility with ObjectARX 2007. Please check ObjectARX 2007 documentation for further information. i am using VS2005,autocad2006 and objectarx2006.when i have built the coding as you have mentioned above,i got lot of errors. is objectarx2006 suitable for vs2005.please help me. VS2005 can be used only with ObjectARX 2007 and AutoCAD 2007. To be compatible with AutoCAD 2004,2005 or 2006 you need to use VS2002 and ObjectARX 2004. Note that are some differences among ObjectARX 2004,2005 and 2006 but if you use only features existing on 2004 it will run fine inside 2005 and 2006. So if you plan to be compatible with all 2004,2005 and 2006 I would recommend you to compile with ObjectARX 2004. Solution Explorer and selecting Properties, C/C++ Folder, Commandline. In the field additional Options I added /MD. After this the project was successfully built. I'm using vb.net to create autoCAD applications. Is that method works for vb.net as well or only for C++.net? Thanks for help in advance. Just what I wanted to learn. Using AutoCad 2007, ObjectARX 2007, VS 8.0.. I followed and built as you said..
And please understand the error messages would be wierd.. 'cuz i'm using my language edition NOT an ENGLISH one.. so I translated..
Have you tried to compile one of the samples that come with ObjectARX2007? From the error list seems to be some syntax error into your files. Could you send me your project by e-mail? Sent e-mail to fpmalard@yahoo.com.br with a .zip file (nealy 5M).. There aren't over 100 errors any more.. Check if your *.lib folder is correct at Visual Studio Options (like the sample shows). Further, check if this folder has some kind of access restrictions. There's a problem on setting. I am a beginner in C++, I just took a course in it this semester and as a final project I have to do something like this: given a cross section in Autocad, computing it's moment of inertia and then showing the closest standard section in Excel. In class we just work on console projects and we don't work with Visual C++. I was using your blog as a tutorial to get familiar with objectARX till this class that I read that we have to change the global Options of Visual Studio and this is something to do with Visual C++. So I don't know if your blog still good for me or not. Could you please give me a hint about that, I am totally clueless. You need to study VC++ and MFC. These are the tools you will need to create complex ObjectARX applications. Take your time and study these things before getting deep into ObjectARX. Remember that ObjectARX is recommended only for high performance and custom entity type applications. If you application is simple I would recommend the C# language. I use the latest vesion of ObjectARX which is the 2008 release. Can we use VS2002, ObjectARX_2008, Autocad_2008. What is the support mix for having the functionality working and to ensure backward compatibility. No, you can´t. ObjectARX 2008 requires VS2005. If you plan to keep your product compatible with both families (2204,2005 and 2006) and (2007,2008 and 2009) you will need to use two project files. The first family can be compiled with VS2002. Note that 2007, 2008 and 2009 require your application to be UNICODE compatible. Of course if you use some specific feature from 2007 it will not compile with previous releases. In this case you can use #ifdef compiler switch to create custom compilations specific to each family. 1. I don't know why the ARX wizard fails to install. It keeps telling me that I've to have VS 2005 installed. I wonder do I have to get the full licensed VS version or can I still use the Express edition version? 2. Can I use VS 2008 express, or must it be the 2005 one? 3. I ignored the wizard and tried to follow your instructions on how to create a project from scratch but I am having hard time creating an MFC dll project. Again I am not sure if this is an express edition problem or I am just doing something wrong? 4. IF I can the express edition, is there any limitations to what I can do with it? I'm not aware of all VC++ 2005 Express edition but one is that it does not came with a Resource Editor so you need to create Resource script files (.rc) by yourself. This is really a pain. Further it does not include both MFC and ATL. Probably it has some limitations regarding third party plug-ins installations like ARXWizard and this explain the problem you are experiencing. I strongly recommend you to acquire at least the Professional version of VC++ 2005 to create your applications. I got the same errors as June.K. 114 erros 24 warnings and the same set of errors mentioned in the comment. How did you fix this code? Hi all, Im using AutoCAD 2007, ObjectARX 2007 and Visual Studio 2005 Version 8.0 and .NET Version 2.0. - Same problem in the .cpp file, the lines beginning with "acutPrintf" both had line feed /returns. Be sure they are in one line. - Finally in ObjectARX 2007 the lib "acdb16.lib" does not exist, use "acdb17.lib" instead. I got crazy with these menus! As I understand from ObjectARX documentation, there are 2 ways to deal with menus: one using “menuload ” / “cuiload” or “_menuload ” / “_cuiload” (it seems to work identically) or using COM following the example from Polysamp sample. When the arx file is automatically loaded by the "acad.rx" I got no menu , nor toolbar loaded! 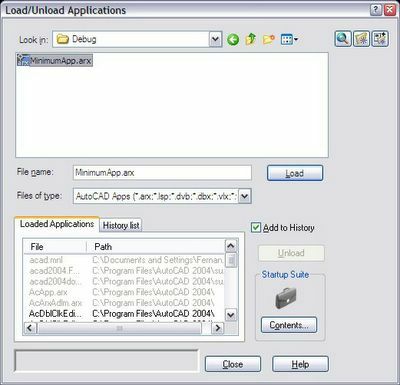 Loading the arx file through "appload" command I can get only the toolbar but no menu! I do not understand what is the problem, becose when I manually load the original mnu file using cuiload command and after the conversion of the file, the menu+toolbar are loaded!, but programatically I can not succeed! Using COM is ok, but I do not know how to set some bitmaps for menu items! I have found no documentation in ObjecArx to show how to do this! 1. I suspect the problem is due the acedCommand() call from inside initialization events. At this startup stage the interface may not be available yet. It will execute the command next time AutoCAD is quiescent. 2.I think the Menu image feature is not exposed through COM interface. Using ads_queueexpr is much better , but I still can not see the menu. The toolbar is present. I do not understand what is the problem, is a simple menu. "Now we need to configure our project..."
I managed to do on 6 versions successfully as well, however after this I'm getting lost. First - I don't get "Configuration" dialog when I "Project -> properties" - I only get a small window, called "Project Folder Properties" where I can't write or change anything, so I don't know how to change both Debug* and Release* settings. In order to get to C/C++ Code Generation I go through right click Project->Settings andchange to "Multithreaded DLL". I do the required changes in .def file, stdafx.h and adding a new cpp file where are store the main code - as you've described. Can you please explain me what does it mean and what should I do. You need to Right click the project's name node inside Solution Explorer tree and then select Properties. You are accessing the project's properties via "Properties" tab which is not the same thing. The errors you have described seem to be a consequence of no project configuration done. Hello Fernando Thank your great blog here. If you’re planning to go 64-bit, replace “win32″ with “x64″ in the folders’ names. Now, your project should build without any problems and generate a .ARX file. But I havent fixed this error and gonna crazy. I prefer to configure my Visual Studio (under Tools |Options|Project and Solutions|VC++ Directions). There you need to add your SDK paths to Include Files, Library Files and also Reference files (in this case use the same path used for Include Files). Inside each specific project you don't need to explicitly specify those LIB files you are linking because the Visual Studio linker is smart enough to search into the Library path and bring in only those libraries it needs. In some special cases you would need to explicitly specify a library but I think this is not your case. Once you do that every new project won't need to be configured again. Of course if you move this project to another machine it will need to have its Visual Studio configured the same way. I was having the same problem as JuneK. #pragma is a compiler instruction and it shouldn't give any errors if correctly used. Have you checked your VS path configuration and if you have the proper ObjectARX release installed? I'm using autocad 2012 x64, ObjectARX 2012 and visual studio 2010. I succesfully compiled the minimum application. However when I load it in autocad I get a message: 'autocad is attempting to load ..arx, which is not compatible with autocad'. But when I select 'Load this application' it just loads without a problem. Any idea? Thanks in advance. Did you install VS2010 service pack? It is required to build compatible ARX modules. I think this will solve your problem but please let me know about it. I installed servicepack 1, but nothing changed. I wanted to try the wizard, but keep getting build errors. This is strange. Are you sure you have a valid Visual Studio install? I'm trying to build arx projects in visual studio 2012 (vs2012) but when I try to link rxapi.lib and acdb19.lib to my project, vs2012 does not shown the ellipsis button on Additional Dependencies. Do you know how to include these two links in vs2012? The Dependencies now are per project. If you have more than one project into your Solution you will need to repeat this process for all of them. because it gives error. I think it can help anybody that is having the same problem. It is curios that the error just happens when I build the project in Debug mode. If I build the project in Release mode that error disappears. No big deal but I am afraid it can give me problems later. It seems the Project Configuration is incorrect in regards to the /MD or /MDd configurations. First, please do not post the same question several times. The website has a Spam protection so all posts need to be approved before they appear. Be patient. You are having a linking problem so you are either missing the Libraries you need or pointing to incorrect Libraries according to the ObjectARX and Visual Studio versions you are using.